Global Insurance Broking: A Strategic Review of the World's Top 150 Commercial Non-Life Insurance Brokers provides a focused analysis of leading competitors in commercial lines broking worldwide. 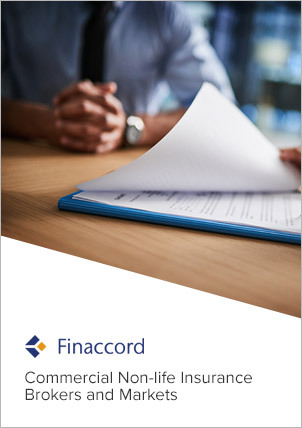 It leverages Finaccord's unrivalled knowledge of commercial non-life (P&C) insurance broking across numerous countries to present not only a ranking of broking groups according to their actual or approximate revenues generated from commercial lines in 2015 but also a series of analyses that further illustrate their presence in this arena. For each of the top 150 broking groups, these include: the percentage weighting of commercial non-life insurance broking revenues within total revenues; the number of countries in which they have offices; the percentage of total revenues derived from countries other than the groups' home markets; the number of acquisitions made that are relevant to their commercial lines broking operations over the 30 months from January 2014 to June 2016; and their main international broker network affiliations (if any). Data is also provided for each group's total revenues in 2015 (i.e. including other sources such as broking of personal lines, employee benefits, wholesale insurance and reinsurance, plus underwriting and consultancy activity) and growth in total broking revenues in the same year relative to 2014.
management consultancies: for consulting firms helping insurance brokers or underwriters with their future strategy in commercial lines insurance, this research will allow them to understand more about the current status of the world's commercial non-life insurance broking market, saving time and effort on researching the subject themselves.